Our trip was originally a Cebu tour but since Bohol is just 1 hour ferry boat ride away, we decided to include it in our itinerary. It was a great decision! We woke up at around 4am to catch the first boat ride (6am). We bought a SuperCat roundtrip ticket for P1,040.- We rented a van from 8am to 5pm for P2,500 (so its really practical and more fun to come in big groups), our driver served as our tour guide. 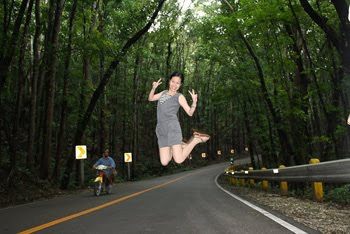 We went to Chocolate Hills first, which is the farthest destination from the Port of Tagbilaran. For only P50.00 we experienced Chocolate Hills - the main tourist spot of Bohol and I'm convinced why. It was an amazing sight. According to kuya, our driver, there are 1,200+ uniformed grass covered hills that changes its color from chocolate brown to green depending on the season. Tourists may think that the hills are man made but its definitely natural at its finest! We climbed 120+ steps to reach an area to enjoy the view and it was worth it. There's even a scandalous wishing well where you can of course make a wish, throw a coin and pull a loud ringing bell. There were many local and foreign visitors and on the way down, we bumped into Korean boys who asked us to take pictures with them, we gladly agreed. Our next stop is the man made forest. Taking photos on this area feels like a scene out of Twilight but instead of wolves or vampires, we looked out for passing vehicles. 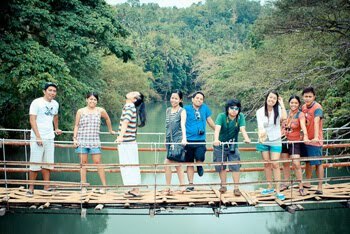 Then a late buffet lunch at Loboc River. The food quality and the variety is okay but P400.00 was worth it because of the experience of eating on a floating restaurant with an amazing view of Loboc River and entertainment from Loboc singers. We decided to be adventurous by trying the Bohol Zipline and Cable Car. This costs P350 plus we got to have a CD of our aerial photos taken by their staff. We were running out of time because we need to catch our 6pm boat ride to Cebu so we just decided to pick 2 more destinations. We literally just passed by "Sikatuna-Legaspi Blood Compact" site, Baclayon Church and Butterfly Conservation Garden. Of course, a Bohol trip wont be complete without Tarsier watching and then we visited the biggest Phyton I've seen. To be honest, I would rather face my fear of heights than deal with animals. I felt stressed being around them. The only thing left is souvineer shopping, peanut kisses is a must have pasalubong. I can say that we made the most of the 8 hours that we spent at Bohol and wow I would definitely recommend a Bohol tour for a nature trip and adventure.